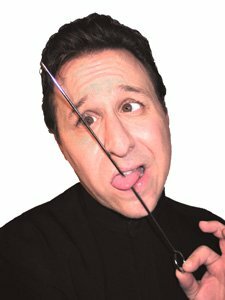 Discount Magic - Spike Through Tongue. Finally the Spike is removed, and the tongue is totally unharmed, with no holes, or blood. This is similar to the Nail Through Finger gag, but used as an authentic mystic feat by Indian magicians and tantriks. Convincingly presented, it has a very strong impact on the audience. Supplied with stainless steel rust proof spike, a duplicate ungimmicked spike for examination and instructions. Spike Through Tongue The performer pushes a solid steel spike through his tongue.